The common mallow is part of the large family of Malvaceae plants that include cotton, okra and hibiscus. It is an edible plant that has been used for medicinal care as well as food. 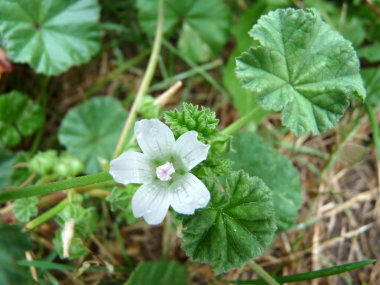 The fruits are round and have cheese-like wedges which give the common mallow its nickname, cheese plant. Mallow stems are flexible and come from a central point, often lounging on the ground. This wild edible is used as herbal medicine in a variety of ways. It is an anti-inflammatory, diuretic, demulcent, emollient, laxative and an expectorant. 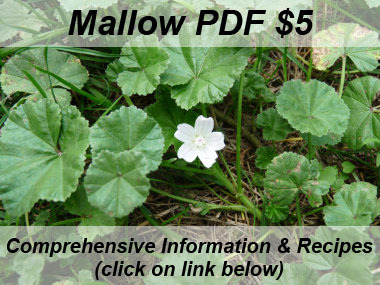 Distinguishing Features: Common mallow is a winter or summer annual or biennial, freely branching at the base, with a prostrate growth habit. 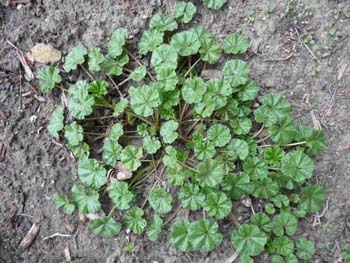 It is a low growing weed, with a deep fleshy tap root. The seeds germinate through the summer and broken stems can also root. This plant has stems that originate from a deep tap root and are low spreading with branches that reach from a few centimetres to almost 60 centimetres long. Flowers: The flowers are borne either singly or in clusters in the leaf axils blooming from June to late autumn. 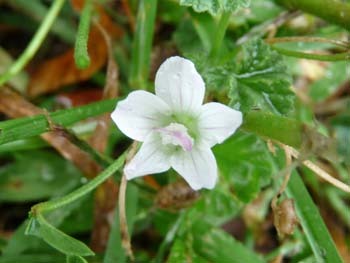 They have 5 petals and are white, pinkish or lilac flowers that measure on average, 1 to 1.5 cm across. Fields of Nutrition has medicinal benefits and vitamin/mineral content of Mallow. Leaves: Common mallow leaves are alternate, on long petioles, circular to kidney-shaped, toothed and shallowly 5-9 lobed, 2-6 cm wide. Short hairs present on upper and lower leaf surfaces, margins and petioles. Height: This plant can grow anywhere from 10 to 60 cm in length. 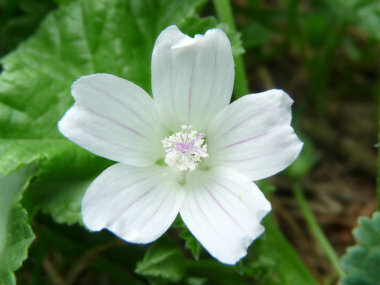 Habitat: The common mallow likes to grow in lawns, gardens, roadsides, waste areas and cropland. It originated in Europe, Asia, and Northern Africa and is also in the Americas and Australia. Edible parts: All parts of this plant are edible. The leaves can be added to a salad, the fruit can be a substitute for capers and the flowers can be tossed into a salad. When cooked, the leaves create a mucus very similar to okra and can be used as a thickener to soups and stews. The flavour of the leaves is mild. Dried leaves can be used for tea. 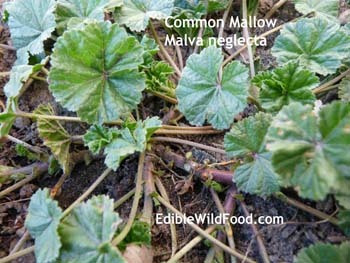 Mallow roots release a thick mucus when boiled in water. The thick liquid that is created can be beaten to make a meringue-like substitute for egg whites. 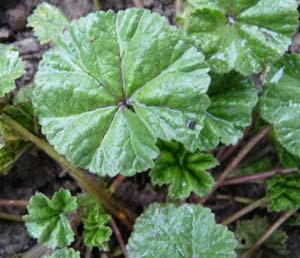 Common mallow leaves are rich in vitamins A and C as well as calcium, magnesium, potassium, iron and selenium.